One single mother. Three escaped pensioners. A road trip across the United States. The new emotionally compelling page-turner by Australia’s Charlotte Nash. Saving You is the beautiful, emotionally compelling page-turner by Charlotte Nash, bestselling Australian author of The Horseman and The Paris Wedding. Absolutely brilliant! This will be one of my top reads for 2019! Mallory Cook’s work at Silky Oaks with the elderly residents was rewarding, and she loved her job. Her greatest achievement though was her five-year-old son Harry. She was excited for his return from New York where he’d been for two weeks with his father for the Easter break. But the non-appearance of both Duncan, Mallory’s husband, and Harry at the Brisbane Airport was the beginning of a journey that would test everything Mallory had ever known about herself. Mallory’s arrival at the Los Angeles airport was joined by a nearby volcano pouring its ash over the airways. Flights were cancelled, hire cars were fully booked, trains were booked out – Mallory was stranded with little money. But her meeting with three elderly people, Ernie, Zadie and Jock seemed like the answer to her prayers. They needed to get to Nashville and had a hire car, their driver had vanished, and Mallory needed to get to New York. As long as she could drive them, all would be fine. The trip across the country was fraught with problems – but the determination of all four was that they would do what they set out to do. Mallory ached to see Harry – what would be the outcome of this seemingly crazy dash from Australia to the US? 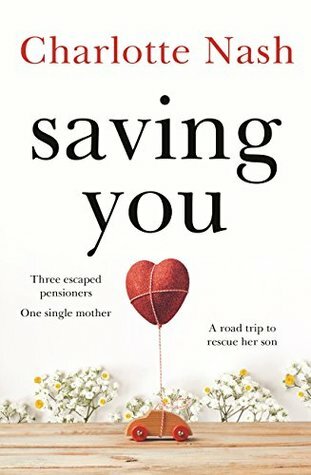 Saving You by Aussie author Charlotte Nash is an emotional, heart warming and heart breaking novel which I absolutely loved. I devoured it, laughing out loud in places, needing the tissues in others. A wonderful novel that I have no hesitation in recommending highly – in my opinion this is the author’s best yet! A credit to you Ms Nash! 5 stars! This entry was posted in Book supplied by publisher or author for review, Contemporary Fiction, Guest Reviewer, Post Script: Book Reviews and tagged #Aussie Author, 5 star read. Bookmark the permalink. Terrific review. This one isn’t available here yet but I was able to download her earlier book, The Paris Wedding. Excited to read this new-to-me author! I hope you can get it soon Anne. Such a great read! Haven’t read anything by this author before, this review makes me want to!